Gordo Throw (ゴルドー投げ, Gordo Throw) is King Dedede's side special move in Super Smash Bros. 4 and Super Smash Bros. Ultimate. King Dedede pulls out a Gordo and hits it with his hammer, sending it bouncing in front of him. The Gordo can bounce up to three times and damages enemies on hit, starting at 14% and becoming progressively weaker, finally bouncing off them. It disappears shortly after hitting an enemy, or after the third bounce if no target is hit. However, if hit by any attack that deals 2% damage or more, it will be reflected back to Dedede rather quickly, becoming able to damage him. If Dedede is KO'd by the reflected Gordo, the character (or stage element) that reflected it gets the KO. It is worth noting that King Dedede can reflect a Gordo back again once it has been initially reflected. However, a safer way to do this that is unique to Dedede that does not involve him attacking Gordo is to have him air dodge into the reflected Gordo. In this case, Dedede will automatically grab the reflected Gordo and hit it back with his hammer. This is generally a better response when anticipating a reflected Gordo, because if Dedede's timing is correct, he will safely return the Gordo. If Dedede's timing is off, his air dodge will allow Gordo to pass by without hitting Dedede. Because this air dodges Gordo return is automatic, Dedede can sometimes SD if he begins the return animation near the bottom of the screen. He will continue to fall until after he hits Gordo away, and there is no way for the user to recover during this animation. In Ultimate, he can also inhale a reflected Gordo to reflect it back, but this will only work if Dedede is currently not in endlag from the initial throw. Neutral angle: the Gordo is able to cover almost the entire distance of Final Destination. The width of each bounce decreases slightly. Angled up: the Gordo covers a much shorter vertical distance, about one-third of Final Destination, but bounces progressively higher, reaching a height about double of King Dedede's. The width of each bounce decreases noticeably. Angled down: the Gordo covers a distance of about three-quarters of Final Destination. The increase in height and the decrease in horizontal distance is very noticeable. Only one Gordo can be thrown at a time; when a Gordo is already out, the attack consists of a single hammer swipe which damages targets for 10%. Gordos will travel farther and faster if the control stick is tapped than if it is tilted. Gordos have a chance of getting stuck in any wall they hit, causing slight damage to opponents that touch them. They will then disappear after a few seconds. This can be utilized as an edgeguarding technique, albeit being very difficult to execute and only works against characters with more vertical recoveries. If King Dedede is interrupted before executing his hammer swipe animation (i.e by hitstun or landing on a Spring), he will drop the Gordo which will bounce harmlessly on the ground. However, he (or other characters) can still hit the Gordo at his rivals. Unlike King Dedede's former side special Waddle Dee Toss, the Gordo Dedede throws will be affected by his size and can in fact travel faster/slower and shorter/further depending on their adapted size. Also, if a Gordo is reflected while very close to another character, it can hit many times very quickly, resulting in unusually high damage. "Throw a Gordo. If opponents attack it with the right timing, they can hit it back." "Throw a Gordo that moves slowly at first, then kicks into high gear after it bounces." "Throw a Gordo that bounces back and forth. Lasts awhile, but each hit doesn't hurt much." Topspin Gordo: The Gordo moves a small distance, then travels fast and far after the first bounce. Angled up: The Gordo bounces slightly higher, and only goes slightly less far. Angled down: The Gordo bounces slightly lower, and only goes slightly further. Bouncing Gordo: The Gordo has electric properties and bounces back and forth for a while covering a wide area instead of going forward. The Gordo deals far less damage. The Gordo Bur Glitch in Super Smash Bros. for Nintendo 3DS. The Gordo is stuck to Dedede and hovers shortly in front of/below him. Gordo Bur: If Dedede attempts to use the side special input to hit back an existing Gordo that has just been deflected by an opponent (though there may be other ways to initiate it), the Gordo may become stuck to Dedede. While he can still use the side special again, he will not throw another Gordo. Gordo will remain hovering without a hitbox underneath Dedede, attached to the bone that normally holds grabbed opponents and Gordos before being thrown, not interacting with anything else in the game. The stuck Gordo's hitbox still exists somewhere on the stage, and an opponent can occasionally be struck by this invisible hitbox for damage, though it is unclear where exactly the hitbox will be. 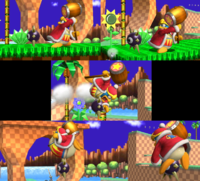 After a hit or two, the hitbox will disappear, and the stuck Gordo will disappear, allowing Dedede to use his side special again. The Gordo will fall off if Dedede uses Jet Hammer, allowing him to re-throw Gordos. The glitch can be seen here. If the animation is slowed down via training mode or use of the timer in SSB4, King Dedede will quickly rotate his hammer between the 14th and 15th frames of the animation, despite this not being depicted if the full speed animation is played frame by frame. This occurs because the game interpolates the movement of objects and limbs between frames when the game speed is slowed down, and it misinterprets a small angle adjustment to the hammer as it having made an almost full 180 degree rotation. 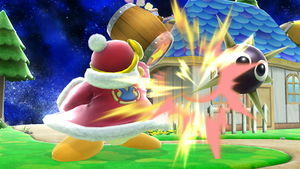 This move is derived from King Dedede's side special move in Super Smash Bros. Brawl, Waddle Dee Toss, wherein Dedede has a rare chance of throwing a Gordo. Gordos are common enemies in Kirby games, serving as spiky hazards that cannot be defeated. In Kirby Star Allies, Dedede’s doppelgänger Parallel Dedede in the mode Heroes in Another Dimension utilizes Gordo Throw in an identical manner. Gordo Throw as shown by a Skill Preview in Ultimate. This page was last edited on April 25, 2019, at 10:30.